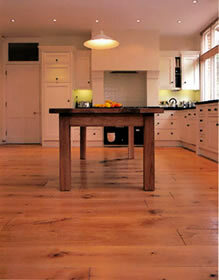 Wooden floor strippers: sanding, new wood flooring, online quote. Wooden floor stripping and sanding. New wood flooring. Get a quote in minutes... free! Tell us about the flooring you want and we'll quote our best price online now. Choose from our wood flooring range of traditional and modern installation styles. Replace carpets and lino. Install over existing floorboards, concrete or wood joists. We strip and sand all types of wood flooring including parquet, floorboards and wood block. We finish and seal with optional wood stain colour and varnish. Our floor sanders are 98% dust free. Do you want to put the life back into your wood floor? Before we seal your newly sanded floor you can choose a wood stain that will colour and dye the wood while preserving the natural look of the wood. Find out why wood is the best choice for your home or office space. Before and after photos of new wood floors and improvements to existing wood floors. Prices for a new parquet wood floor? For this quote the wood is american white oak with a herringbone pattern. How long does it take? We quoted 2 days to finish this. What will it cost for a new strip wood floor? For this quote the wood is wenge with a set width strip pattern. How long does it take? We quoted 3 days to finish this. For this quote the wood is ash with a herringbone pattern. How long would it take? We quoted 2 days to finish this.